Moments as projections of an image’s intensity onto a proper polynomial basis can be applied to many different aspects of image processing. These include invariant pattern recognition, image normalization, image registration, focus/ defocus measurement, and watermarking. 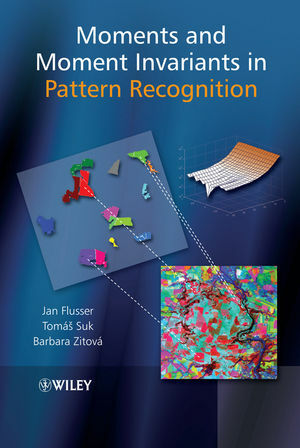 This book presents a survey of both recent and traditional image analysis and pattern recognition methods, based on image moments, and offers new concepts of invariants to linear filtering and implicit invariants. In addition to the theory, attention is paid to efficient algorithms for moment computation in a discrete domain, and to computational aspects of orthogonal moments. The authors also illustrate the theory through practical examples, demonstrating moment invariants in real applications across computer vision, remote sensing and medical imaging. Presents a systematic review of the basic definitions and properties of moments covering geometric moments and complex moments. Considers invariants to traditional transforms – translation, rotation, scaling, and affine transform - from a new point of view, which offers new possibilities of designing optimal sets of invariants. Reviews and extends a recent field of invariants with respect to convolution/blurring. Introduces implicit moment invariants as a tool for recognizing elastically deformed objects. Compares various classes of orthogonal moments (Legendre, Zernike, Fourier-Mellin, Chebyshev, among others) and demonstrates their application to image reconstruction from moments. Offers comprehensive advice on the construction of various invariants illustrated with practical examples. Includes an accompanying website providing efficient numerical algorithms for moment computation and for constructing invariants of various kinds, with about 250 slides suitable for a graduate university course. Moments and Moment Invariants in Pattern Recognition is ideal for researchers and engineers involved in pattern recognition in medical imaging, remote sensing, robotics and computer vision. Post graduate students in image processing and pattern recognition will also find the book of interest. Professor Jan Flusser, PhD, Dsc, is a director of the Institute of Information Theory and Automation of the ASCR, Prague, Czech Republic, and a full professor of Computer Science at the Czech Technical University, Prague, and at the Charles University , Prague. Jan Flusser’s research areas are moments and moment invariants, image regristration, image fusion, multichannel blind deconvolution and super-resolution imaging. He has authored and coauthored more than 150 research publications in these areas, including tutorials (ICIP’05, ICIP’07, EUSIPCO’07, CVPR’08, FUSION’08, SPPRA’09, SCIA’09) and invited/keynote talks (ICCS’06, COMPSTAT’06, WIO’06, DICTA’07, CGIM’08) at major international conferences. He gives undergraduate and graduate courses on digital image processing, pattern recognition, and moment invariants and wavelets. Personal webpage http://www.utia.cas.cz/people/flusser. Tomáš Suk, PhD, is a research fellow of the same Institute. His research interests include invariant features, moment and point-based invariants, color spaces and geometric transformations. He has authored and coauthored more than 50 research publications in these areas, some of which have elicited a considerable citation response. Tomás Suk coauthored tutorials on moment invariants held at international conference ICIP’07 and SPPR’09. Personal webpage http://zoi.utia.cas.cz/suk. Barbara Zitová, PhD, is Head of the Department of Image Processing at the same Institute. Her research interest is mainly in image regi8stration, invariants, wavelets, and image processing applications in cultural heritage. She has authored and coauthored more that 30 research publications in these areas, including tutorials at international conferences (ICIP’05, ICIP’07, EUSIPCO’07, FUSION’08 and CVPR’08). Her paper “Image Registration Methods: A Survey,” Image and Vision Computing, vol. 21, pp. 977-1000, 2003, has become a major reference work in image registration . She teaches a specialized graduate course on moment invariants and wavelets at the Czech Technical University. Personal webpage http://zoi.utia.cas.cz/zitova. 2 Moment invariants to translation, rotation and scaling. 2.2 Rotation invariants from complex moments. 2.4 Combined invariants to TRS and contrast changes. 2.5 Rotation invariants for recognition of symmetric objects. 2.6 Rotation invariants via image normalization. 2.7 Invariants to nonuniform scaling. 3.2 AMIs derived from the Fundamental theorem. 3.3 AMIs generated by graphs. 3.4 AMIs via image normalization. 3.5 Derivation of the AMIs from the Cayley–Aronhold equation. 3.7 Affine invariants of color images. 3.8 Generalization to three dimensions. 4 Implicit invariants to elastic transformations. 4.2 General moments under a polynomial transform. 4.3 Explicit and implicit invariants. 4.4 Implicit invariants as a minimization task. 5.2 Blur invariants for centrosymmetric PSFs. 5.3 Blur invariants for N-fold symmetric PSFs. 6.2 Moments orthogonal on a rectangle. 6.3 Moments orthogonal on a disk. 6.4 Object recognition by ZMs. 6.5 Image reconstruction from moments. 7 Algorithms for moment computation. 7.2 Moments in a discrete domain. 7.3 Geometric moments of binary images. 7.4 Geometric moments of graylevel images. 7.5 Efficient methods for calculating OG moments. 7.6 Generalization to n dimensions. 8.2 Object representation and recognition.